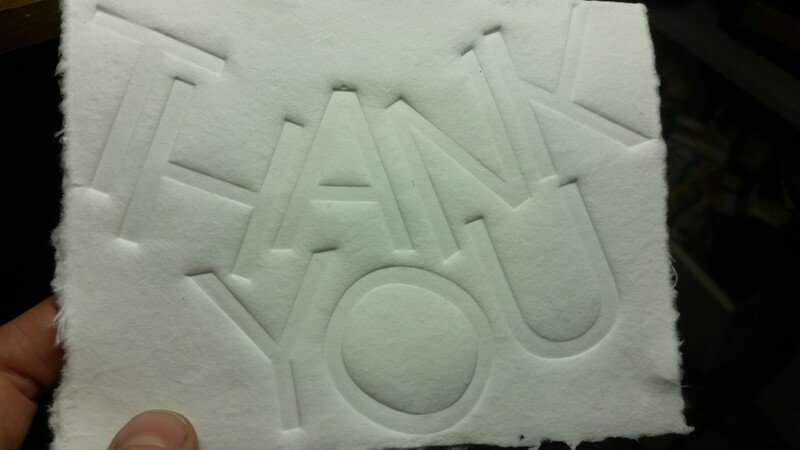 Embossing a Thank You Card with a Pocket Press! I got some super generous and thoughtful gifts this Christmas, so I decided to make thank you cards myself. I love letterpress, but I don’t have the funds or the focus to invest in a letterpress. So, I decided to think about ways my pocket press can be used this way. The heavy emboss makes me swoon, and I just got some cotton paper from Kelsey Pike Paper+Craft so I started poking around my studio. These marquee letters I found at a thrift store once were perfect. It was easy to break the little tabs off the back. The only problem was that the “N” would turn out backwards… so I found a “W” and took saw to it. Take a look- the “N” looks italicized. The next puzzle was getting it all onto one card- so I decided to squeeze the lettering together. No adhesive needed because my Magic Platen’s magic coating holds the letters in place when pressure is applied. I soaked the paper for about 20 minutes, and I was careful to locate the letters underneath the felt before pressing each row. I wanted to keep in mind where the letters stopped so I wouldn’t cause the paper to break when stepping from the letter to the platen. I think I could have put down a layer of craft foam under my felt to help absorb and apply pressure. I will try this on the next card! Look how well this turned out! Who needs a letterpress?